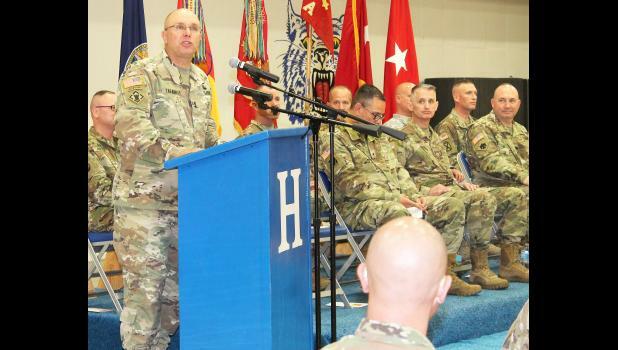 For the families of the men and women of Battery A, 2nd Battalion of the 130th Field Artillery Regi­ment of the Kansas National Guard, Friday morning’s deploy­ment ceremony in the Holton High School gym was an emotional time. “He’s prepared us like they’ve prepared him,” said Natasha Schott of Edgerton, whose husband, Spec. Nicholas Schott, is one of the 120 men and women who are deploying in support of the United States Central Command and Operation Spartan Shield, an ongoing U.S. Army training mission in Kuwait. But for the battery’s command­ing officer, Capt. Michael Sprigg, it was also an exciting time that marked the end of nine months of “a strenuous, extremely aggressive training plan” for the battery and the start of a year’s deployment.